WHen cranberries come on sale in early fall. I start buying them and putting them in the freezer. 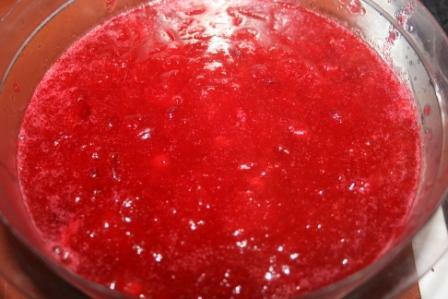 I love cranberries year around.. I love to make cookies with dried cranberries, cranberry bread. I'm sure the list would go on and on.. Enjoy your day with family and friends. Have a great Thanksgiving~!~! ta ta for now from Iowa...26 degrees this morning.. Happy Thanksgiving to you and your family! May you have a great and blessed day! My husband mixes my homemade cranberry sauce into his dressing that he makes along with some pecans, apples, onions and celery. He loves it! I never even considered making homemade cranberry sauce. Mmmmm that sounds sooooo good!